Here’s another update from SMBAS Blog on that large, disc-like, shining object which has frequently and mysteriously appeared in our nighttime sky this year (furtively whispered of in dismal fens as…the moon). Dec. 13, 4:05 p.m. PST — Full Cold Moon. December is usually considered the month that the winter cold begins to fasten its grip. It is also called the Full Long Night Moon since nights are at their longest and darkest. 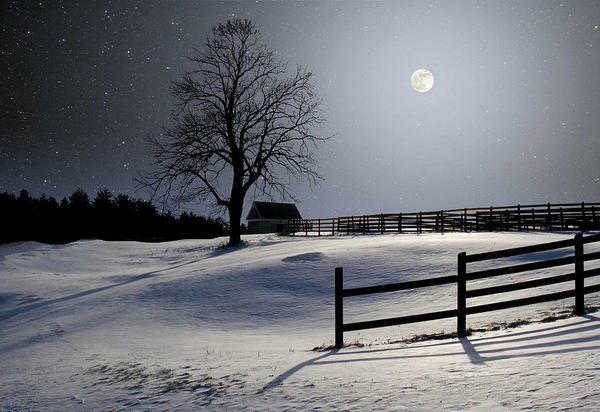 The term “Long Night Moon” is a doubly appropriate name because the mid-winter night is indeed long and the moon hangs above the horizon for a long time. The mid-winter full moon takes a high trajectory across the sky because it is opposite to the low sun. This moon was also occasionally called the Moon before Yule. This particular full moon makes its highest arc across the sky because it’s diametrically opposite to the low sun. This month’s moon is, like last month’s, a supermoon, but slightly less super than last month’s super-duper supermoon. Watch out for high tides and flooding, especially if there is an oceanic storm surge. A birding friend recently introduced me to his wife with: “This is our moon-obsessed blogger,” a humorous bit of overkill. I think people should look up at the sky more often; if birds are few, look at the sun, moon, stars or planets. Many people are astonishingly ignorant of what’s out there (“out” is more accurate than “up”). Apropos this, Discover Magazine’s Dan Hurley (Dec. 2016) had an interesting anecdote. That, in my opinion, is pretty sad, and demonstrates a widespread cultural disconnection with the real world. So we here at SMBAS blog are doing our little bit for education. Next year we shall keep you abreast of fast-breaking astronomical news by promoting solar equinoxes and solstices. Plus – big news – there is a total solar eclipse coming on August 21, 2017. If you’ve seen partial solar eclipses but never a total, the difference between them is the difference between night and day. Seriously. For most people, this is a once-in-a-lifetime event. Make plans and get proper eye-wear. Earliest sunrise: 5:41 am PDT, 12 June, 2017 at 61°, or 29° N of due east. Latest sunset: 8:08 pm PST, 28 June, 2017, at 299°, or 29° N of due west. Earliest sunset: 4:43 pm PDT, 3 Dec, 2016, at 243°, or 27° S of due west. Latest sunrise: 6:59 am PST, 7 Jan, 2017, 117°, or 27° S of due east. Shortest day of the year: 20-21 Dec. 2016 at 9:53:03. Longest day of the year: 20 Jun 2017 at 14:25:34. Difference: shortest to longest, is 4 hours, 32 minutes, 31 seconds. As we go further north the latest and earliest sunrises and sunsets still don’t occur on the solstices. Check the table for Anchorage, AK for December, 2016. Earliest sunset: 3:40 pm PDT, 15-16 Dec, 2016, at 217°, or 37° W of due south. Latest sunrise: 10:15 am PST, 25-26 Dec, 2016, 143°, or 37° E of due south. The Old Farmer’s Almanac has a page for each full moon. A December tip: go fishing on 1st – 1th, 29th – 31st. Now you know, so you have no excuse. The next significant full moon will occur on Jan. 12, 2017, 3:34 a.m. PST. Keep an eye on this spot for additional late-breaking news on this unprecedented event.